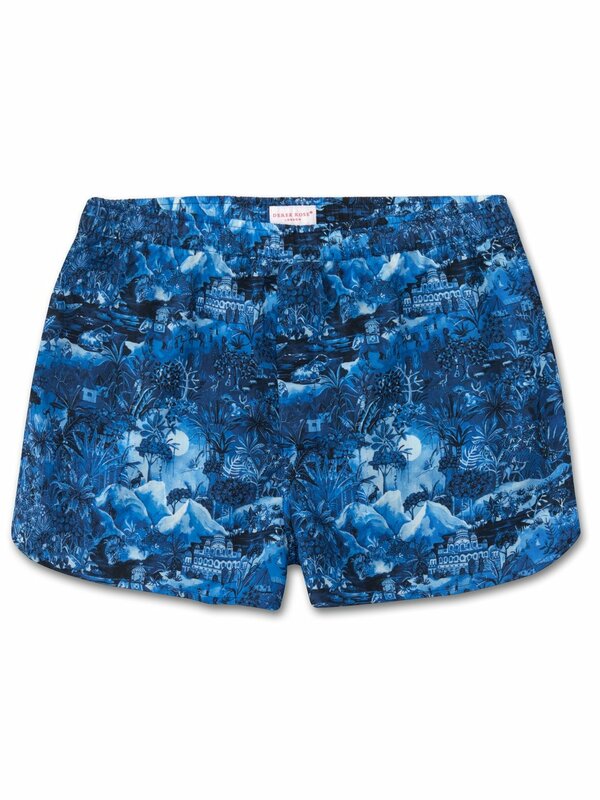 The detailed Ledbury 10 men's modern fit boxer shorts are adorned with our signature hand-painted print of the season which takes you on a voyage through the waterways and rice paddies of Kerala, India. The riverbanks are bursting with wildlife and nature, with this dream-like scene also including elements of other areas of India, from the elephant polo of Jaipur to the grand palaces of Rajasthan. You may even spot an appearance from Derek in his Regimental pyjamas! A modern take on the classic boxer short - our modern fit boxer shorts feature a streamlined shape for a flattering design that remains comfortable. By removing excess fabric from the traditional back panel with a flat fell centre seam, we have which enclosed the material edges for minimal skin contact and less irritation. An elasticated waistband, curved leg seams and side vents ensure longevity and practicality, whilst our self-seeking magnetic fly closure is a hidden blessing to every man that has ever worn a boxer short. This simple but revolutionary feature allows easy opening and hassle-free closure of the fly.